Studies from our laboratory have revealed a novel μ opiate receptor, μ3, which is expressed in both vascular tissues and leukocytes. The μ3 receptor is selective for opiate alkaloids and is insensitive to opioid peptides. We now identify the μ3 receptor at the molecular level using a 441-bp conserved region of the μ1 receptor. Sequence analysis of the isolated cDNA suggests that it is a novel, alternatively spliced variant of the μ opiate receptor gene. To determine whether protein expressed from this cDNA exhibits the biochemical characteristics expected of the μ3 receptor, the cDNA clone was expressed in a heterologous system. At the functional level, COS-1 cells transfected with the μ3 receptor cDNA exhibited dose-dependent release of NO following treatment with morphine, but not opioid peptides (i.e., Met-enkephalin). Naloxone was able to block the effect of morphine on COS-1 transfected cells. Nontransfected COS-1 cells did not produce NO in the presence of morphine or the opioid peptides at similar concentrations. Receptor binding analysis with [3H]dihydromorphine further supports the opiate alkaloid selectivity and opioid peptide insensitivity of this receptor. These data suggest that this new μ opiate receptor cDNA encodes the μ3 opiate receptor, since it exhibits biochemical characteristics known to be unique to this receptor (opiate alkaloid selective and opioid peptide insensitive). Furthermore, using Northern blot, RT-PCR, and sequence analysis, we have demonstrated the expression of this new μ variant in human vascular tissue, mononuclear cells, polymorphonuclear cells, and human neuroblastoma cells. The first demonstration by Kosterlitz and coworkers (1) that exogenous morphine can bind to receptors in mammalian brain indicated that morphine binds to the same sites as those used by the endogenous opioid peptides (e.g., enkephalins). Since then, demonstration of the multiplicity of receptor types has led to the understanding that, depending on their site of action, opioid peptides as well as opiate alkaloids may bind to more than one opiate receptor subtype (2, 3, 4, 5). Different degrees of selectivity have been recognized for the various ligands by comparing affinity constants as well as relative strengths in competitive binding assays. For example, Pasternak and Snyder (6) reported both high and low affinity binding sites for [3H]dihydromorphine ([3H]DHM)3 and [3H]naloxone in the rat brain. The higher affinity type was designated μ1, and the lower affinity morphine-selective type was designated μ2 (7, 8). In addition to the two main μ opiate receptor subtypes, μ1 and μ2, our laboratory has demonstrated a third μ opiate receptor (μ3; GenBank no. AY195733) that is selective for opiate alkaloids but insensitive to opioid peptides. Functional studies have shown that μ3 is expressed on immunocytes and neural tissues of the invertebrate Mytilus edulis as well as on human monocytes, granulocytes, vascular endothelial cells, and other cells, including those of the nervous system (9, 10, 11). Recently, we have demonstrated the μ3 binding site on human vascular endothelial cells (11), and using RT-PCR we have amplified transcript fragments with 100% homology to μ1 that are constitutively expressed (12, 13). We have now identified the human μ3 opiate receptor subtype at the molecular level as a truncated μ splice variant that when transfected into COS-1 cells exhibits the expected functionality: NO release in an opiate alkaloid-selective and opioid peptide-insensitive manner as well as the previously described binding and physiological characteristics of the μ3 receptor (14, 15). To obtain full-length human μ3 receptor mRNA, we screened several human cDNA libraries, including heart, brain, kidney, and leukocytes, by PCR using the 441-bp μ opiate receptor gene (Oprm)-specific primers (see below). A human testis cDNA library, constructed with the SMART cDNA Library Construction kit (Clontech, Palo Alto, CA), exhibited the highest expression levels of the desired PCR product. The SMART cDNA Library Construction kit provides a method for producing high quality, full-length cDNA libraries from nanograms of total or poly(A)+ RNA. All reagents and conditions in this kit have been optimized to improve the efficiency of all library construction steps. The λ TriplEx2 vector, a phagemid vector, used in this system yields high titer libraries, blue/white screening for recombinants, regulated expression of cloned inserts, and ease of converting clones from phage to a plasmid vector via Cre-lox-mediated subcloning. Total RNA was reverse transcribed using SuperScript reverse transcriptase (Invitrogen, Carlsbad, CA) and a modified oligo(dT) primer. The cDNA library was then constructed following the manufacturer’s instructions. The final library titer was 10−8 PFU/ml. The amplified library was screened by PCR with μ-specific primers designed to amplify a 441-bp fragment starting at map position 896 (primer 5′-GGTACTGGGAAAACCTGCTGAAGATCTGTG-3′) and at map position 1336 (primer 5′-GGTCTCTAGTGTTCTGACGAATTCGAGTGG-3′) of the μ1 cDNA. Following sequence analysis to confirm its identity, the PCR fragment was used as a probe for hybridization screening. XL1-Blue host Escherichia coli infected with the phage containing the PCR fragment was plated on a 150-mm Luria-Bertoni medium/MgSO4 plate and incubated at 37°C overnight. The plates were then chilled at 4°C overnight. 0.45-μm nylon filters (Amersham Pharmacia Biotech) were used to screen the library. Following a 4-h prehybridization step at 42°C for 4 h (with agitation) in ExpressHyb buffer (Amersham Pharmacia Biotech), the filters were incubated with [α-32P]dCTP-labeled PCR fragment, which was added to the ExpressHyb solution and incubated at 42°C for 16–20 h. The filters were removed and then washed in wash buffer 1 (Fisher Scientific, Pittsburgh, PA) for 15–20 min at room temp, and then at 65°C for 1 h. The wash was repeated once. The filters were blotted dry on Whatman 3 MM paper (Clifton, NJ) at room temperature and then exposed to Kodak XAR film with an intensifying screen at −70°C for 16–24 h. Positive plaques were purified through rescreening, after which an isolated positive plug was removed, placed in 25 μl of H2O, and vortexed. Five microliters of the eluted plaque was used in a PCR reaction to screen for the μ insert using λ TriplEx LD-Insert Screening Amplimers. The estimated size of the insert was determined by electrophoresis on a 0.8% ethidium bromide-stained agarose gel with 1-kb ladder DNA size markers, and then sequenced using the ABI PRISM BigDye Terminator Cycle Sequencing Ready Reaction Kit, as previously described. COS-1 cells were stably transfected with the expression vector pExP1 (Clontech, Palo Alto, CA) containing the μ3 cDNA using the Clonfectin Transfection Kit (Clontech). Stable cell lines were selected with puromycin (Sigma-Aldrich, St. Louis, MO) at a concentration of 7.5 μg/ml. The stable transfectants were grown in DMEM supplemented with 10% FBS (Sigma-Aldrich) at 37°C and then screened by RT-PCR for the μ3 opiate receptor variant transcript. The cells were subsequently used for functional analysis. Human heparinized whole blood obtained from volunteer blood donors (Long Island Blood Services, Melville, NY) was immediately separated using 1-Step Polymorphs (Accurate Chemical & Scientific, Westbury, NY) gradient medium. Five milliliters of heparinized blood was layered over 3.5 ml of polymorphs in a 14-ml round-bottom tube and then centrifuged for 35 min at 500 × g in a swinging-bucket rotor at 18°C. After centrifugation, the top band at the sample/medium interface consisting of mononuclear cells (MN) and the lower band consisting of polymorphonuclear cells (PMN) were harvested in 14-ml tubes and then washed with PBS (Life Technologies, Gaithersburg, MD) by centrifugation for 10 min at 400 × g. In addition, residual RBCs were lysed using RBC lysing buffer. Internal thoracic artery and atrial fragments, regarded as waste, were obtained from patients undergoing elective coronary artery bypass grafting for atherosclerotic coronary artery disease. The institutional review board approved the project. Patients were chosen as described in detail previously (16). Anesthetic induction and maintenance were performed using fentanyl (fentanyl citrate adjusted for pH) or sufentanil. These agents do not bind to the μ3 endothelial opiate receptor, and they do not share NO-inducing actions with morphine (17, 18). Once obtained, the tissues were stored in an electrolyte solution at 4°C (500 cc of plasmalyte with 5000 U of heparin and 60 mg of papaverine) and immediately transported on ice to the laboratory for processing as described in detail previously (19). Vascular endothelial cells were obtained from the vessel walls by gentle scraping (13). Transfected and nontransfected COS-1 cells (1 × 106), human vascular endothelial cells, MN, and PMN cells (5 × 105), were pelleted by centrifugation, and total RNA was isolated with the RNeasy Protect Mini Kit (Qiagen, Stanford, CA). Pelleted cells were resuspended in buffer RLT and homogenized by passing the lysate five times through a 20-gauge needle fitted to a syringe. The samples were then processed following the manufacturer’s instructions. In the final step, the RNA was eluted with 50 μl of RNase-free water by centrifugation for 1 min at 10,000 rpm. Total RNA from vascular endothelial cells was isolated using the same procedure, but was homogenized with a cordless motor and a sterile pellet pestle (Fisher Scientific). First-strand cDNA synthesis was performed using random primers (Invitrogen). Three micrograms of total RNA isolated from transfected and nontransfected COS-1 cells and human cells or tissues were denatured at 95°C and reverse transcribed at 40°C for 1 h using Superscript II RNase H-RT (Invitrogen). Seven microliters of the RT product was added to the PCR mix containing specific primers for the μ opioid receptor gene and Taq DNA polymerase (Invitrogen). The PCR reaction was denatured at 95°C for 5 min, followed by 35 cycles at 95°C for 1 min, 57°C for 1 min, and 72°C for 1 min, and then an extension step cycle at 72°C for 10 min. PCR products were analyzed on a 2% agarose gel (Sigma-Aldrich) stained with ethidium bromide. 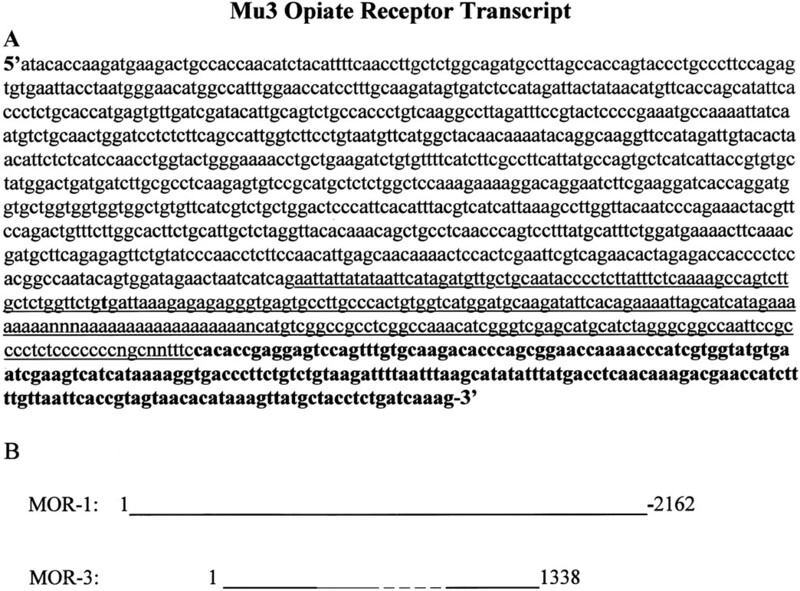 The μ-specific primer used in the PCR reactions amplified a 605-bp fragment starting at map position 896 (5′-GGTACTGGGAAAACCTGCTGAAGATCTGTG-3′) of the μ opioid receptor conserved region and a reverse primer (5′-CATCCATGACCACAGTGGGCAAGGCAC-3′) from the μ3 opiate receptor splice variant sequence. Other μ1 primers were used (5′-CGGATGAGCCTCTGTGAACTACTA-3′, position 1 of Oprm mRNA, and 5′-GATCCTTCGAAGATTCCTGTCCT3′), generating a 1052-bp fragment. In the transfected cells, only the presently described variant was detected. The beginning segment of this gene encodes the third extracellular loop of the receptor that is important for μ agonist selectivity. The bands corresponding to the expected size fragment were excised, purified with the QiaQuick gel extraction kit (Qiagen), ligated into the pCR4-TOPO vector using the TOPO TA cloning kit for sequencing (Invitrogen), and then transformed TOP10 chemically competent cells (Invitrogen). Transformed cells were grown overnight in a 37°C incubator shaker, and plasmid DNA was purified using the QiaPrep miniprep kit (Qiagen) and then sequenced (Seqwright, Houston, TX). Total RNA was isolated from human heart tissue, leukocytes, and COS-1 cells stably transfected with the μ3 cDNA using the RNeasy Protect Mini Kit (Qiagen). RNA (40 μg) from the various tissues was separated on a 1.5% formaldehyde agarose gel and washed twice for 10 min each time with double-distilled water and then twice with 10× SSC buffer. The gel was transferred onto a nylon membrane (Roche, Indianapolis, IN) overnight by capillary action in 10× SSC buffer, and then washed with 3× SSC buffer for 20 min. The blot was baked for 1 h at 80°C and then prehybridized with ExpressHyb buffer (Amersham Pharmacia Biotech) for 1.5 h in a 65°C hybridization oven. The blot was hybridized at 65°C overnight with a 32P-labeled, 198-bp probe specific for the μ3 gene. After hybridization the blot was washed for 20 min at room temperature with 2× SSC/0.1% SDS, and then washed twice at high stringency with 0.5× SSC/0.1% SDS for 15 min each wash. The blot was air-dried and then exposed to x-ray film. For NO determination, 2.5 × 105 cells were placed in each well of a 96-well plate (Falcon) and allowed to adhere overnight in 200 μl of DMEM supplemented with 2% FBS (Invitrogen). Before NO determination, the medium was removed and replaced with 200 μl of PBS solution. Transfected COS-1 cells as well as nontransfected cells were plated and tested. NO release from the transfected and nontransfected cell lines was directly measured using an NO-specific amperometric probe (30 μm, 0.5 mm; World Precision Instruments, Sarasota, FL). A micromanipulator (World Precision Instruments), which was attached to the stage of an inverted microscope (Diaphot; Nikon, Melville, NY), was used to position the amperometric probe 15 μm above the cells. The system was calibrated daily by nitrosothiol donor S-nitroso-N-acetyl-d,l-penicillamine, resulting in liberation of a known quantity of NO (World Precision Instruments). The amperometric probe was allowed to equilibrate for at least 10 min before being transferred to the well containing the cells. Morphine-stimulated NO release was evaluated at final concentrations of 10−5–10−9 M. The receptor antagonists (naloxone or d-Phe-Cys-Tyr-Trp-Orn-Thr-Pen-Thr-NH2) were added at 10−5 M 30 min before morphine addition. Addition of the opioid peptides Met-enkephalin, [d-pen2,5]-enkephalin, and Leu-enkephalin were also evaluated at 10−7 and 10−9 M. Each experiment was repeated four times along with a control (nontransfected cells). COS-1 cells (transfected with μ3 and nontransfected) were homogenized separately in 50 vol of 0.32 M sucrose, pH 7.4, at 4°C, with a Polytron (30 s, setting 5; Brinkmann Instruments, Westbury, NY). The crude homogenate was centrifuged at 900 × g for 10 min at 4°C, and the supernatant was reserved on ice. The whitish crude pellet was resuspended by homogenization (15 s, setting 5) in 30 vol of 0.32 M sucrose/Tris-HCl buffer, pH 7.4, and centrifuged at 900 × g for 10 min. The extraction procedure was repeated once, and the combined supernatants were centrifuged at 900 × g for 10 min. The resulting supernatants (S1′) were used immediately. Immediately before the binding experiment, the S1′ supernatant was centrifuged at 30,000 × g for 15 min, and the resulting pellet (P2) was washed once by centrifugation in 50 vol of 0.32 M sucrose/Tris-HCl buffer, pH 7.4. The P2 pellet was then resuspended with a Dounce hand-held homogenizer (10 strokes; Kontes Co., Vineland, NJ) in 100 vol of the same buffer. Displacement analysis was then performed on the cell membrane suspensions as follows. Aliquots containing 40 μg of membrane protein plus 0.1% BSA from transfected and nontransfected COS-1 cells were incubated in triplicate at 25°C for 40 min with labeled [3H]DHM (58 Ci/mmol; DuPont-New England Nuclear, Boston, MA) at 40 nM, with or without 0.1 nM to 1 mM unlabeled ligand. Specific binding was defined as total binding minus that with 10 μM unlabeled ligand (nonspecific binding). Nonspecific binding was <18% of total binding in routine competition studies. Nontransfected COS-1 cells, which do not express the μ3 splice variant (see Table I⇓), did not exhibit a μ3 displacement profile or any type of opiate binding that could be regarded as specific (data not shown). Previously, work from our laboratory and others established the presence of a unique opiate receptor, referred to as μ3, which is biochemically characterized by its opiate alkaloid selectivity and its insensitivity to opioid peptides. To identify μ3 at the molecular level, we screened a human testis cDNA library using an Oprm gene-specific probe and identified a 1338-bp clone (see Materials and Methods). Sequencing of this clone and subsequent analysis (National Center for Biotechnology Information Blast software) shows that the clone exhibits 100% identity to μ1 in the center and conserved region, but is truncated at the 5′ end (position 503 of μ1 mRNA; missing several hundred nucleotides). In addition, the 3′ end of the new clone contains a new fragment of 263 bases followed by the 202-bp fragment of the 3′ end of the μ1 gene untranslated region (Fig. 1⇓) (4). The predicted amino acid sequence of the new clone was also determined by Blast software (Fig. 2⇓). A, μ3 cDNA sequence (1338 bp). The underlined sequence represents the novel 263-bp segment, and the bold letters represent Homo sapiens Oprm 3′-untranslated region DNA sequence (nucleotide position 1625–1829 of Oprm). B, The diagram shows the μ3 cDNA sequence starting at position 503 of Oprm. The dotted lines represent the novel 263-bp μ3 sequence (between nucleotides 1376 and 1625 of Oprm), and position 1625–1829 is the Oprm 3′-untranslated region DNA sequence that represents the 3′-end of μ3. Predicted amino acid sequence for the μ3 opiate receptor. The predicted amino acid sequence was determined using Blast software. By RT-PCR and subsequent sequence analysis we analyzed human vascular endothelial cells (1 × 106), MN, and PMN cells (1 × 107) for expression of the 605-bp fragment of the μ3 cDNA with specific μ3 primers (Fig. 3⇓). The expected 605-bp fragment was excised and then sequenced, revealing 100% sequence identity to the cloned μ3 sequence (see sequence in Fig. 1⇑). Except for the expected band in the human neuroblastoma cells (a positive control), we did not observe any amplification products from the various tissues using primers that should amplify a 1052-bp fragment of the μ1 cDNA (Fig. 3⇓B). In addition, PCR reactions using the same μ1-specific primers with samples from nontransfected COS-1 cells showed that they do not express the μ1 receptor (data not shown). Analysis of μ1 and μ3 receptor expression was repeated several times (more than five times) with different tissue samples, and similar results were obtained each time. A, RT-PCR analysis of μ3 gene expression in human vascular endothelial cells, MN, PMN, and human neuroblastoma cells. Lane 1, Human vascular endothelial cells; lane 2, human MN cells; lane 3, human PMN cells; lane 4, human neuroblastoma cells; lane 5, negative reagent control; lane 6, 100-bp DNA marker. B, μ1 receptor gene and β-actin reference gene analysis from various human tissues. 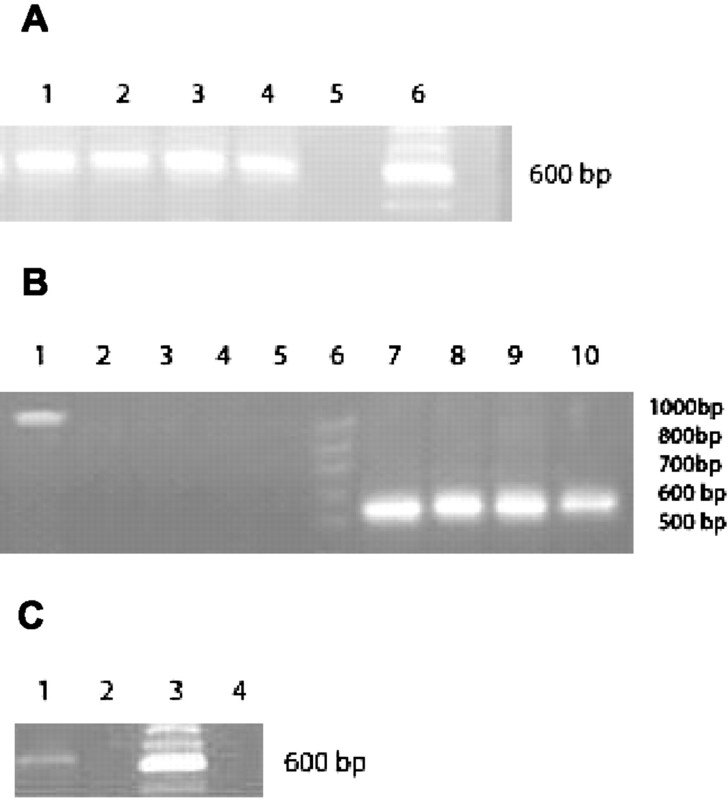 μ1 receptor gene-specific primers were used to amplify a 1052-bp fragment of the μ1 cDNA. β-Actin reference gene primers were used to amplify a 539-bp fragment. Lane 1, Human neuroblastoma cells; lane 2, human MN cells; lane 3, human PMN cells; lane 4, human vascular endothelial cells; lane 5, no sample; lane 6, 100-bp DNA marker; lanes 7–10, β-actin reference gene (lane 7, human neuroblastoma cells; lane 8, human MN cells; lane 9, human PMN cells; lane 10, human vascular endothelial cells). C, μ3 receptor gene analysis in μ3-transfected and nontransfected COS-1 cells. μ3-specific primers were used to amplify a 605-bp fragment. Lane 1, COS-1 transfected cells; lane 2, nontransfected COS-1 cells; lane 3, 100-bp DNA marker; lane 4, negative reagent control. To determine whether the cDNA clone we isolated was functional and had the biochemical properties expected of the μ3 receptor, we expressed the cDNA in a heterologous system (COS-1 cells). To demonstrate expression of the μ3 cDNA in COS-1 cells, both μ3 receptor-transfected and nontransfected COS-1 cells were screened by RT-PCR with μ3-specific primers. Our results show that only μ3-transfected COS-1 cells express the μ3 cDNA (Fig. 3⇑C). To demonstrate the expression of a functional μ3 receptor in transfected COS-1 cells we measured NO release in response to the addition of receptor ligand. Following exposure to 10−6 M morphine, the transfected COS-1 cells released an average of 36 ± 8.0 nM NO (Fig. 4⇓A). Naloxone (10−5 M) was able to block morphine-stimulated NO release from these cells (Fig. 4⇓A), whereas d-Phe-Cys-Tyr-Trp-Orn-Thr-Pen-Thr-NH2 (10−5 M) did not (data not shown). The addition of Met-enkephalin, [d-pen2,5]-enkephalin, or Leu-enkephalin did not stimulate NO release (Fig. 4⇓A). Nontransfected COS-1 cells failed to produce any detectable NO upon addition of morphine (Fig. 4⇓B). These results show that transfection of the novel cDNA clone isolated from human testes conferred the expected opiate alkaloid-selective and opioid peptide-insensitive characteristics of the μ3 opiate receptor (12, 13, 14, 15). A, Real-time NO production measurements in μ3-transfected COS-1 cells after addition of the opiate alkaloid, morphine, or the opioid peptides, Met- and Leu-enkephalin. The control represents the addition of PBS to the cells. Each experiment was replicated four times ± SEM. B, Peak concentration-dependent morphine-stimulated NO release from COS-1 cells and μ3-transfected COS-1 cells. Each experiment was replicated four times; results shown are the mean ± SEM. In addition, we analyzed human heart endothelial tissue, human leukocytes, and transfected COS-1 cells for expression of μ3 mRNA by Northern blot analysis. A band of the approximate predicted size (1338 bp) was observed in the various tissues (Fig. 5⇓). μ opiate receptor 3 (MOR-3) Northern blot analysis. Expression of the MOR-3 mRNA was determined with a 32P-labeled, 198-bp probe specific for μ3. Lane 1, COS-1 transfected cells with the MOR-3 cDNA; lane 2, human leukocytes; lane 3, human heart endothelial cells; lane 4, nontransfected COS-1 control cells; lane 5, skipped; lane 6, RNA m.w. marker (Sigma-Aldrich). A variety of opioid peptides exhibiting affinities for the κ, μ, and δ opiate receptor subtypes were found to be ineffective (Ki = >1000 nM) in displacing specifically bound [3H]DHM (Table I⇑). By contrast, the opiate alkaloid μ ligands exhibited a Ki of 32 nM (dihydromorphine) and 29 nM (morphine). Naloxone and naltrexone inhibited [3H]DHM binding with Ki values of 31 and 39 nM, respectively. Additionally, the nontransfected cells exhibited only nonspecific binding, demonstrating the lack of any type of opiate receptor. This binding profile in the transfected cells fits the previously describe binding characteristics of the μ3 opiate receptor (9, 10, 11). In this study we demonstrate the presence of a novel truncated splice variant of the μ opiate receptor, designated μ3, that is expressed on human monocytes, granulocytes, and vascular endothelial cells that do not express the μ1 opiate receptor subtype. The μ3 receptor cDNA, compared with μ1, is truncated at the 5′-end, missing several hundred nucleotides, but the middle and conserved region sequences are identical with μ1. The 3′ end of μ3 exhibits 100% identity to the 3′ end of the μ1 variant, followed by a new fragment of 263 bases, and then a 201-bp fragment of the 3′ end of the μ1 gene untranslated region. When expressed in a heterologous system (COS-1 cells), this cDNA confers the expected functionality of μ3: morphine-induced NO release that is opioid peptide insensitive and opiate alkaloid selective (11, 17, 20, 21). The tissues that we identify as expressing μ3 do not express the μ1 opiate receptor subtype, demonstrating the presence and physiological significance of the μ3 receptor. Furthermore, a single class of μ-like opiate binding sites, exhibiting opiate alkaloid selectivity and opioid peptide insensitivity, i.e., μ3, was demonstrated using COS-1 cells that express μ3 cDNA, supporting the NO functional data we present. The nontransfected cells exhibited only nonspecific binding, demonstrating and supporting our molecular evidence for the lack of any opiate receptor expression on these cells. The μ3 opiate receptor subtype, as determined by binding and pharmacological assays, has been shown to be expressed on immunocytes and neural tissues of the invertebrate, Mytilus edulis, as well as on human monocytes, granulocytes, and vascular endothelial cells. In each of these tissues the receptor appears to be coupled to constitutive NO release (9, 10, 11, 17, 20, 22, 23). The novelty and selectivity of this G protein-coupled, naloxone-sensitive receptor was made apparent when a variety of opioid peptides were found to be ineffective in displacing specifically bound DHM, whereas opiate alkaloids were quite potent (9). In this report we found that only one set of μ-specific primers used in the PCR reactions (from map position 896-1336) yielded a specific PCR product (13). This segment of the cDNA encodes the third extracellular loop of the receptor that is important for μ agonist selectivity (24, 25). The fact that the initial cDNA fragment we amplified showed 100% sequence identity with the human brain μ1 opiate receptor (26) suggested that μ3 may be a splice variant. Alternatively, the μ3 phenotype may have been mediated by the μ1 receptor, and functional diversity may have been generated by altering the downstream molecules in the signaling pathway or by alterations in the protein’s conformation (27). The results from our present study suggest, however, that μ3 is a functional splice variant. Our identification of a novel splice variant is in line with previous studies regarding the μ opiate receptor gene. These studies show that oligonucleotides complementary to some, but not all, exons of the mouse μ opiate receptor can block effects mediated by the μ1 and μ2 receptor subtypes (28). This implies that μ1 and μ2 share some, but not all, exon sequences, as would be expected of splice variants. In addition, to date,= only a single μ gene has been identified in mouse chromosomal DNA (29). Furthermore, recent studies have identified additional exons of the μ opiate receptor gene, resulting in a total of four splice variants for the Oprm receptor protein. These studies taken together with previous work (30) show that Oprm has at least 14 exons that can generate 15 different splice variants (31). None of the proteins expressed by these alternatively spliced transcripts have been shown to have the receptor binding properties of μ3; however, part of the μ3 sequence at the 3′ end has been found on chromosome 6, which also contains the Oprm gene encoding opioid receptor μ1, complete sequence (Kay, M, direct submission to GenBank, accession no. AL13644). In examining Oprm knockout mice, Tyr-d-Ala2,Gly-N-Me-Phe4,Gly(ol)(5)-enkephalin μ1 and μ2 binding sites were lost (24), but no noticeable variations were reported for the other opioid receptors or in the levels of endogenous opioid peptides (27). Opiate alkaloid binding, however, was not examined, so it is not known whether the μ3 phenotype is dependent on the Oprm gene. Given our recent molecular results (13), we would expect to find a loss of this μ receptor as well. The opiate alkaloid selectivity of μ3 and its opioid peptide insensitivity, including to endomorphin-1 and -2 and nociception, is correlated with the coupling of μ3 to constitutive NO synthase-derived NO release (14). This morphine-stimulated NO release is naloxone sensitive and, as antagonized by the NO synthase inhibitors N-nitro-l-arginine and Nω-nitro-l-arginine methyl ester and occurs in human immunocytes and endothelial cells and in the vasculature of the median eminence (21, 32). The selectivity of the μ3 opiate receptor subtype, therefore, provides further evidence for the status of morphine as an endogenous signaling molecule (15). In summary, we have isolated a cDNA clone for μ3 that is probably a splice variant of the opiate receptor gene. It exhibits 100% identity with μ1 cDNA in the central and conserved regions, but has a truncated 5′ end and a unique exon at the 3′ end. When expressed in a heterologous system, the protein produced from this cDNA exhibits all the biochemical characteristics of the μ3 receptor. The isolation of this novel splice variant will enable further studies of μ opiate receptor structure and function, as well as permit studies of the factors that control alternative splicing of the μ gene in different cell types. We thank Dr. Thomas V. Bilfinger for supplying tissues and Dr. Doris Peter for thoughtful discussions. ↵1 This work was supported in part by National Institute of Drug Abuse Grant DA09010. ↵3 Abbreviations used in this paper: DHM, dihydromorphine; MN, mononuclear cell; Oprm, μ opiate receptor gene; PMN, polymorphonuclear cell. Lord, J. A. H., A. A. Waterfield, J. Hughes, H. W. Kosterlitz. 1977. Endogenous opioid peptodes:Multiple agonists and receptors. Nature 267:495. Traynor, J. R., J. Elliott. 1993. δ-Opioid receptor subtypes and cross-talk with μ-receptors. Trends Pharmacol. Sci. 14:84. Clark, J. A., L. Liu, M. Price, B. S. Hersh, M. Edelson, G. W. Pasternak. 1989. Kappa opiate receptor multiplicity: evidence for two U50, 488-sensitive K1 subtypes and a novel K3 subtype. J. Pharmacol. Exp. Ther. 251:461. Rothman, R. B., V. Bykov, B. R. DeCosta, A. E. Jacobson, K. C. Rice, L. S. Brady. 1990. Interaction of endogenous opioid peptides and other drugs with four κ binding sites in guinea pig brain. Peptides 11:311. Stefano, G. B., P. Melchiorri, L. Negri, T. K. Hughes, B. Scharrer. 1992. (d-Ala2)-deltorphin I binding and pharmacological evidence for a special subtype of delta opioid receptor on human and invertebrate immune cells. Proc. Natl. Acad. Sci. USA 89:9316. Pasternak, G. W.. 1986. Multiple μ opiate receptors: biochemical and pharmacological evidence for multiplicity. Biochem. Pharmacol. 35:361. Wolozin, B. L., G. W. Pasternak. 1981. Classification of multiple morphine and enkephalin binding sites in the central nervous system. Proc. Natl. Acad. Sci.USA 78:6181. Lutz, R. A., R. A. Cruciani, T. Costa, P. J. Munson, D. Rodbard. 1984. A very high affinity opioid binding site in a rat brain: demonstration by computer modeling. Biochem. Biophys. Res. Commun. 122:265. Stefano, G. B., A. Digenis, S. Spector, M. K. Leung, T. V. Bilfinger, M. H. Makman, B. Scharrer, N. N. Abumrad. 1993. Opiatelike substances in an invertebrate, a novel opiate receptor on invertebrate and human immunocytes, and a role in immunosuppression. Proc. Natl. Acad. Sci. USA 90:11099. Makman, M. H., T. V. Bilfinger, G. B. Stefano. 1995. Human granulocytes contain an opiate receptor mediating inhibition of cytokine-induced activation and chemotaxis. J. Immunol. 154:1323. Stefano, G. B., A. Hartman, T. V. Bilfinger, H. I. Magazine, Y. Liu, F. Casares, M. S. Goligorsky. 1995. Presence of the μ3 opiate receptor in endothelial cells: coupling to nitric oxide production and vasodilation. J. Biol. Chem. 270:30290. Cadet, P., G. B. Stefano. 1999. Mytilus edulis pedal ganglia express μ opiate receptor transcripts exhibiting high sequence identity with human neuronal μ1. Mol. Brain Res. 74:242. Cadet, P., T. V. Bilfinger, C. Fimiani, D. Peter, G. B. Stefano. 2000. Human vascular and cardiac endothelia express μ opiate receptor transcripts. Endothelium 7:185. Stefano, G. B.. 1999. The μ3 opiate receptor subtype. Pain Forum 8:206.-209. Stefano, G. B., Y. Goumon, F. Casares, P. Cadet, G. L. Fricchione, C. Rialas, D. Peter, D. Sonetti, M. Guarna, I. Welters, et al 2000. Endogenous morphine. Trends Neurosci. 9:436. Bilfinger, T. V., A. Hartman, Y. Liu, H. I. Magazine, G. B. Stefano. 1997. Cryopreserved veins used for myocardial revascularization: a 5 year experience and a possible mechanism for their increased failure. Ann. Thorac. Surg. 63:1063. Magazine, H. I., Y. Liu, T. V. Bilfinger, G. L. Fricchione, G. B. Stefano. 1996. Morphine-induced conformational changes in human monocytes, granulocytes, and endothelial cells and in invertebrate immunocytes and microglia are mediated by nitric oxide. J. Immunol. 156:4845. Bilfinger, T. V., C. Fimiani, G. B. Stefano. 1998. Morphine’s immunoregulatory actions are not shared by fentanyl. Int. J. Cardiol. 64:61. Stefano, G. B., M. Salzet, H. I. Magazine, T. V. Bilfinger. 1998. Antagonist of LPS and IFN-γ induction of iNOS in human saphenous vein endothelium by morphine and anandamide by nitric oxide inhibition of adenylate cyclase. J. Cardiovasc. Pharmacol. 31:813. Liu, Y., D. Shenouda, T. V. Bilfinger, M. L. Stefano, H. I. Magazine, G. B. Stefano. 1996. Morphine stimulates nitric oxide release from invertebrate microglia. Brain Res. 722:125. Stefano, G. B., B. Scharrer, E. M. Smith, T. K. Hughes, H. I. Magazine, T. V. Bilfinger, A. Hartman, G. L. Fricchione, Y. Liu, M. H. Makman. 1996. Opioid and opiate immunoregulatory processes. Crit. Rev. Immunol. 16:109. Stefano, G. B., B. Scharrer. 1996. The presence of the μ3 opiate receptor in invertebrate neural tissues. Comp. Biochem. Physiol. 113C:369. Sonetti, D., E. Ottaviani, G. B. Stefano. 1997. Opiate signaling regulates microglia activities in the invertebrate nervous system. Gen. Pharmacol. 29:39. Matthes, H. W. D., R. Maldonado, F. Simonin, O. Valverde, S. Slowe, I. Kitchen, K. Befort, A. Dierich, M. Le meur, P. Dollé, et al 1996. Loss of morphine-induced analgesia, reward effect and withdrawal symptoms in mice lacking the μ-opioid-receptor gene. Nature 383:819. Gaveriaux-Ruff, C. E., H. W. D. Matthes, J. Peluso, B. L. Kieffer. 1998. Abolition of morphine-immunosuppression in mice lacking the μ-opioid receptor gene. Proc. Natl. Acad. Sci. USA 95:6326. Zimprich, A., T. Simon, V. Hollt. 1995. Cloning and expression of anisoform of the rat μ opioid receptor (rMORiB) which differs in agonist induced desensitization from rMOR1. FEBS Lett. 359:142. Gaveriaux-Ruff, C. E., B. Kieffer. 1999. Opioid receptors: gene structure and function. C. Stein, ed. Opioids in Pain Control 1.-20. Cambridge University Press, Cambridge. Rossi, G. C., Y. X. Pan, G. P. Brown, G. W. Pasternak. 1995. Antisense mapping of the MOR-1 opioid receptor: evidence for alternative splicing and a novel morphine-6β-glucuronide receptor. FEBS Lett. 369:192. Kaufman, D. L., D. E. Keith, Jr., B. Anton, J. Tian, K. Magendzo, D. Newman, T. H. Tran, D. S. Lee, C. Wen, Y. R. Xia. 1995. Characterization of the murine μ opioid receptor gene. J. Biol. Chem. 270:15877. Bare, L. A., E. Mansson, D. Yang. 1994. Expression of two variants of the human μ opioid receptor mRNA in SK-N-SH and human brain. FEBS Lett. 354:213. Pan, Y. X., J. Xu, L. Mahurter, E. Bolan, M. Xu, G. W. Pasternak. 2001. Generation of the μ opioid receptor (MOR-1) protein by three new splice variants of the OPRM gene. Proc. Natl. Acad. Sci. U.S.A. 98:14084. Prevot, V., C. Rialas, D. Croix, M. Salzet, J.-P. Dupouy, P. Puolain, J. C. Beauvillain, G. B. Stefano. 1998. Morphine and anandamide coupling to nitric oxide stimulated GnRH and CRF release from rat median eminence: neurovascular regulation. Brain Res. 790:236.